Google have launched its BigQuery cloud service in May to support interactive analysis of massive datasets up to billions of rows. Shortly after this launch Qliktech, one of the market leaders in BI solutions who is known for its unique associative architecture based on colunm store, in-memory database demonstrated a Qlikview Google BigQuery application that provided data visualization using BigQuery as backend. 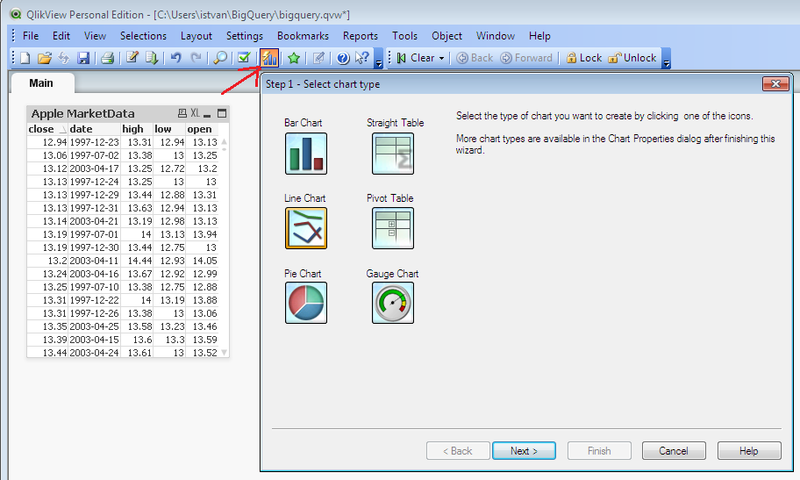 This post is about how Qlikview and Google BigQuery can be intagrated to provide easy-to-use data analytics application for business users who work on large datasets. 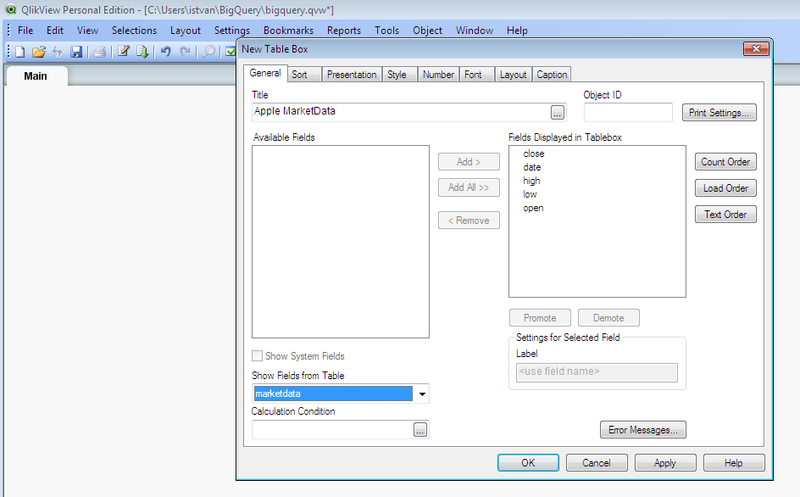 Qlikview BigQuery Connector: this add-on is written in .NET – thus it requires Microsoft .NET 4 framework to be installed on your computer -, it loads the data into the in-memory data model and various view types (table, barchart, etc) can be then created on the fly to visualize the data or its subset. 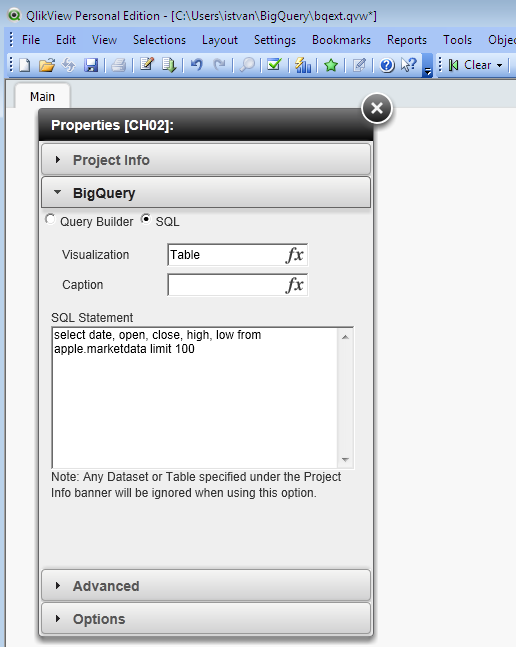 Before we start working with Qlikview BigQuery solutions, we need to create a dataset in Google BigQuery. 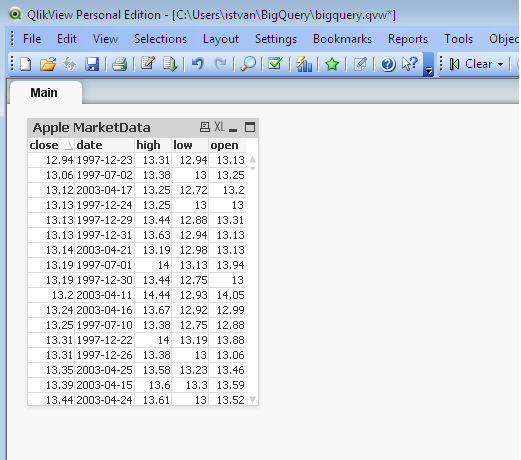 We are going to use Apple marketdata donwloaded from finance.yahoo.com site in csv format. 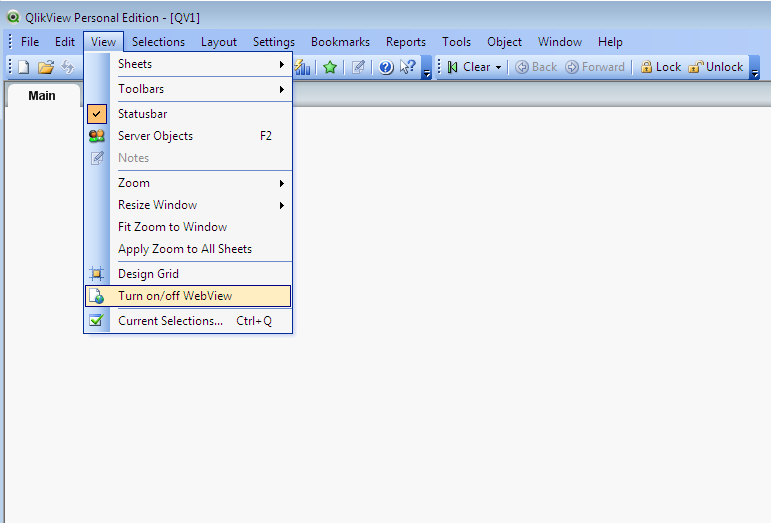 We need to have Qlikview installed, in my test I used Qlikview Personal Edition that can be dowloaded for free from Qliktech website. 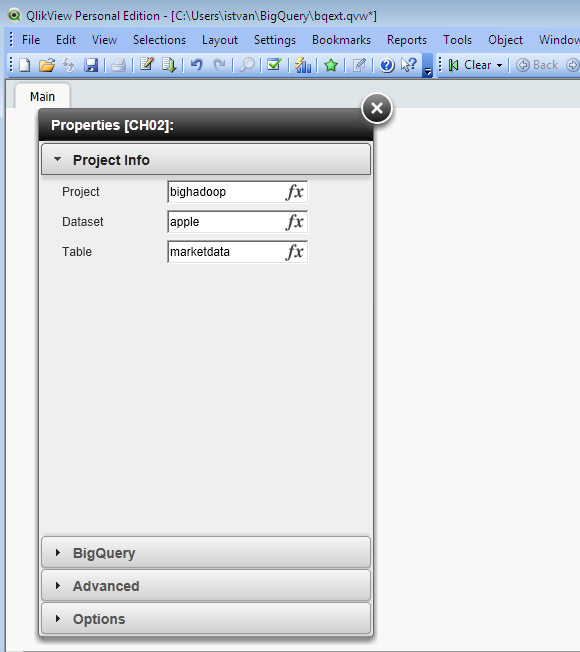 Then we need to download Qlikview BigQuery Connector from Qlikview market. Once we click on Connect, an authorization window pops up on the screen – Google BigQuery relies on OAuth2.0, thus we need to have OAUth2.0 client id and client secret. 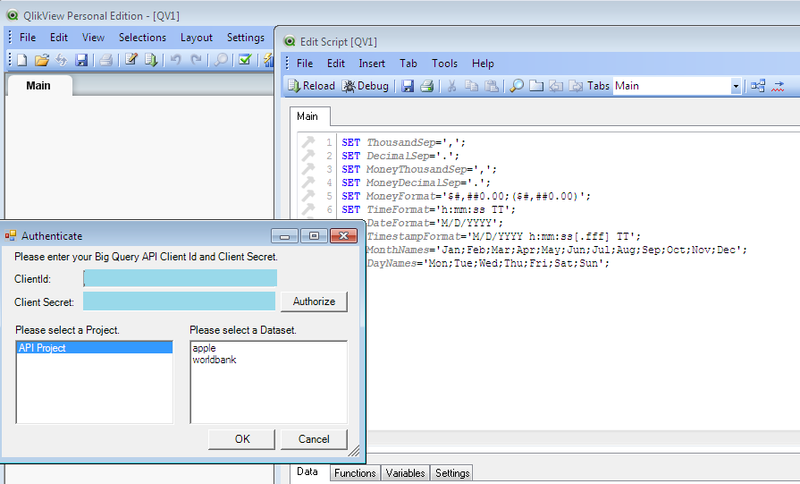 The client id and client secret can be created using Google API console. Select ‘Installed application’ and ‘Other’ options. As said before, not necessarily all the data can fit into the memory – even if Qlikview is very strong at compressing data, we are talking about massive datasets, aren’t we – that is what big data is all about. 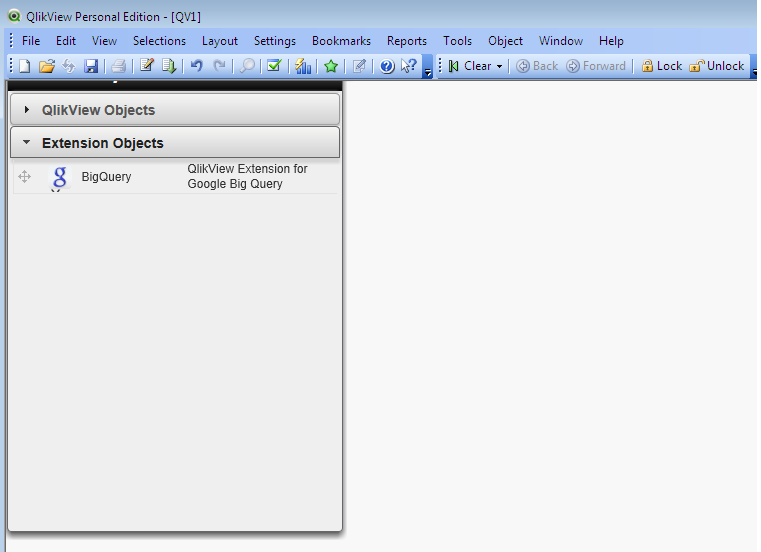 In this case Qlikview BigQuery Extension Object comes to the rescue. 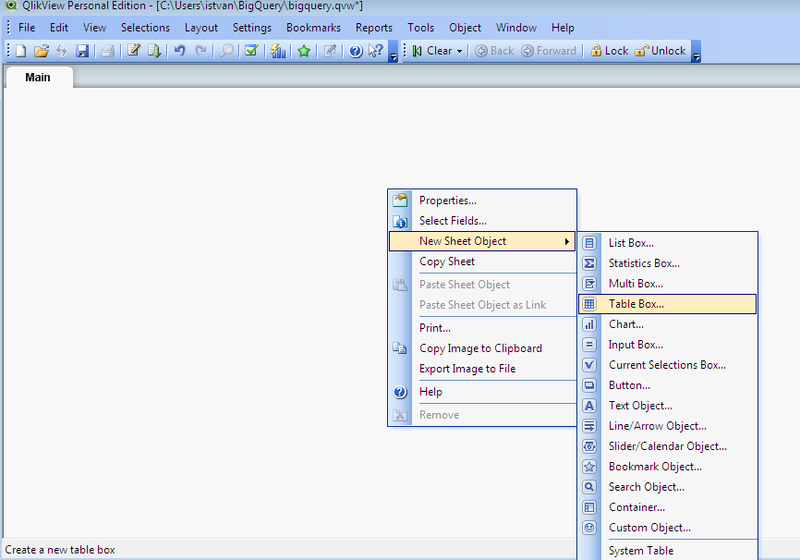 We need to download it from Qlikview market and install it. 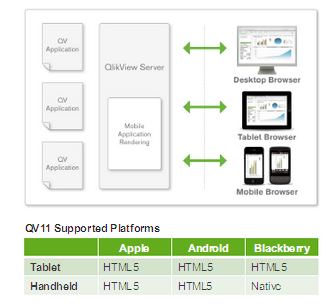 QlikTech promotes a unified approach for delivering BI solutions for different platforms based on HTML5, no need for additional layers to support data analytics and visualization on mobile devices. 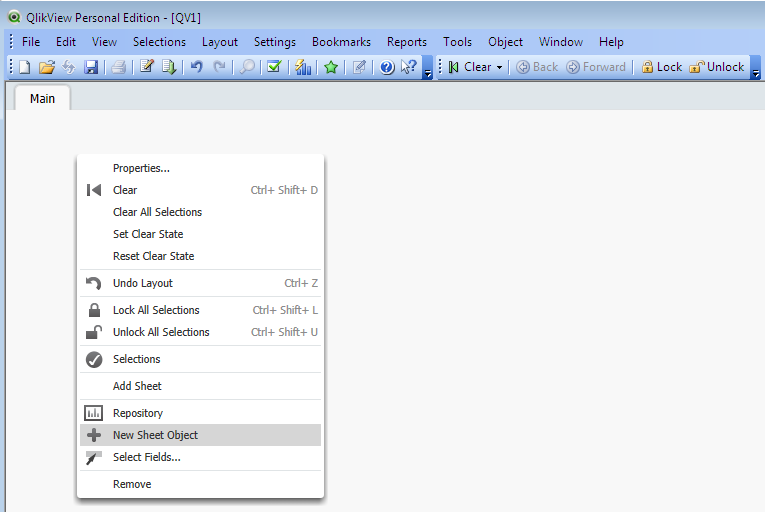 Qlikview Server is capable of recognizing mobile browsers and supports touch-screen functionalities. Qlikview has gained significant popularity among BI tools, Gartner positioned QlikTech in the leaders zone of the Business Inteligent Platforms Magic Quadrant in 2012. It provides highly interactive, easy-to-use graphical user interface for business users and the technology partnership with Google to provide seamless integration with BigQuery can just further strengthen its position. 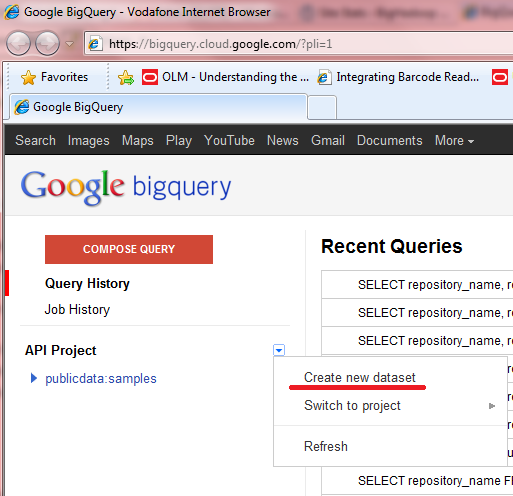 This time I write about Google BigQuery, a service that Google have made publicly available in May, 2012. It was around for some time, some Google Research blog talked about it in 2010, then Google have announced a limited preview in November, 2011 and eventually it went live this month. The technology is based on Dremel, not MapReduce. The reason for having an alternative to MapReduce is described in the Dremel paper: “Dremel can execute many queries over such data that would ordinarily require a sequence of MapReduce … jobs, but at a fraction of the execution time. Dremel is not intended as a replacement for MR and is often used in conjunction with it to analyze outputs of MR pipelines or rapidly prototype larger computations“. 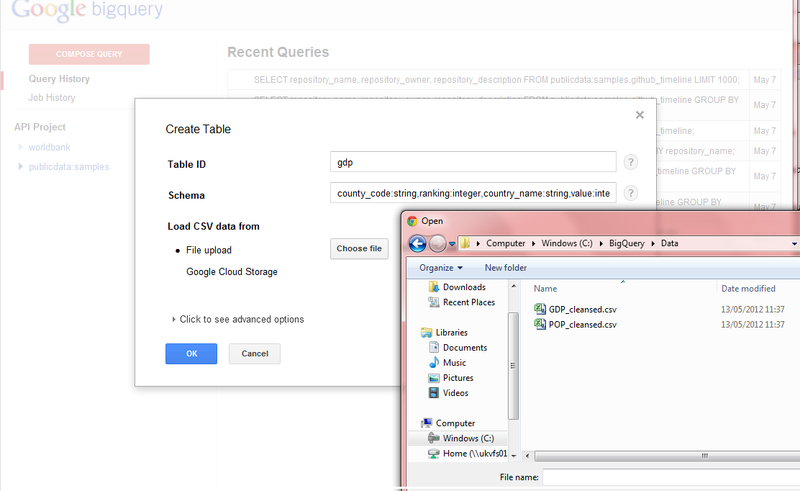 In order to be able to use BigQuery, first you need to sign up for it via Google API console. Once that is done, you can start using the service. 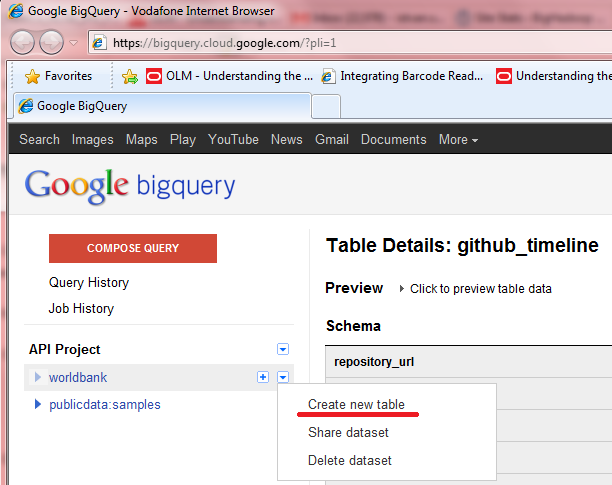 The easiest way to start with is BigQuery Browser Tool. So far so good… Let us create now our own tables. The dataset that I was using is from WorldBank Data Catalogue and these are GDP and population data for the countries all over the world. 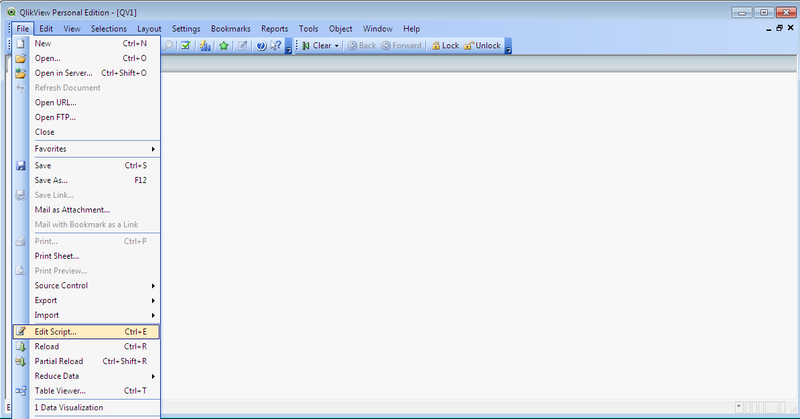 These are available in CSV format (as well as Excel and PDF). 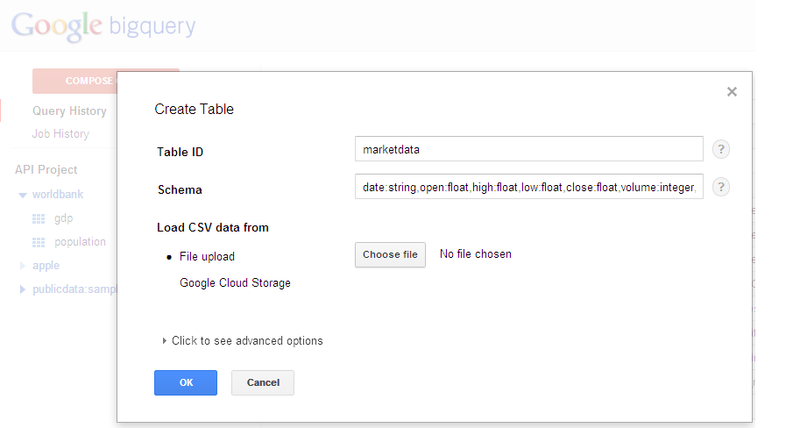 As a first step, we need to create the dataset – dataset is basically one or more tables in BigQuery. 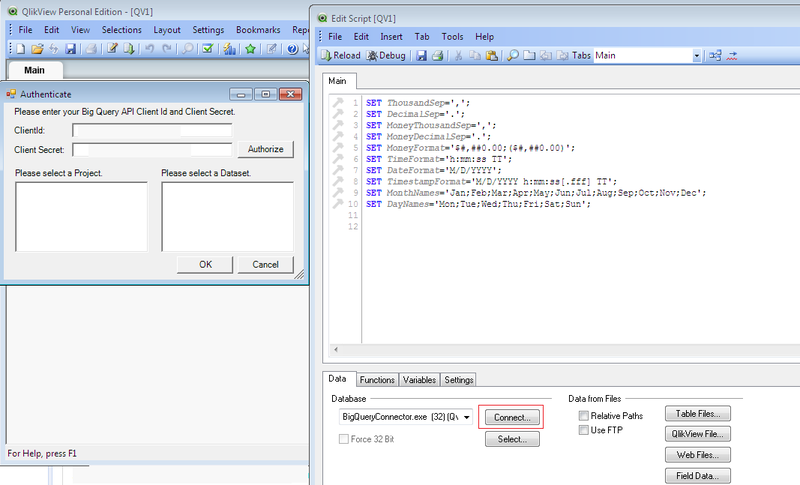 You need to click on the down-arrow icon, next to the API project and select “Create new dataset”. 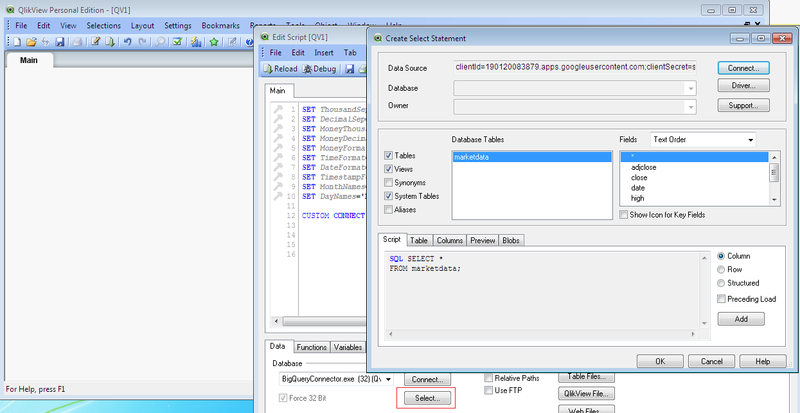 Then you need to define table parameters such as name, schema and source file to be uploaded. Note: Internet Explorer 8 does not seem to support CSV file upload (“”File upload is not currently supported in your browser.” message occurs for File upload link). You’d better go with Chrome that supports CSV file upload. There are advanced option available, too: you can use e.g tab separated files instead of comma separated ones, you can defined how many invalid rows are accepted, how many rows are skipped, etc. That was easy but we are hard-core software guys, aren’t we? We need command line, not just browser based functionality! 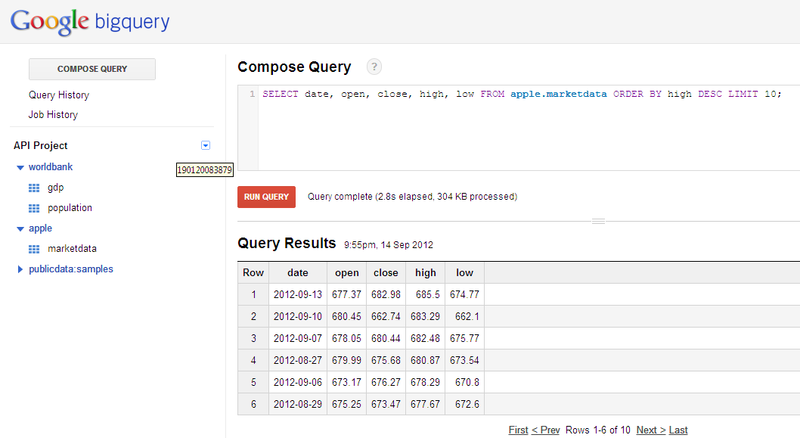 Relax, there is BigQuery command line tool, written in python. You can download it from here and install it by unzipping the file. I used BigQuery Command line tool from a Windows 7 machine, the usage is very same on Linux with the exception of where the credentials are stored in your local computer. (that could be ~/.bigquery.v2.token and ~/.bigqueryrc in case of Linux and %USERPROFILE%\.bigquery.v2.token and %USRPROFILE%\.bigqueryrc in case of Windows). When you run it at the first time it needs to be authenticated via OAuth2. 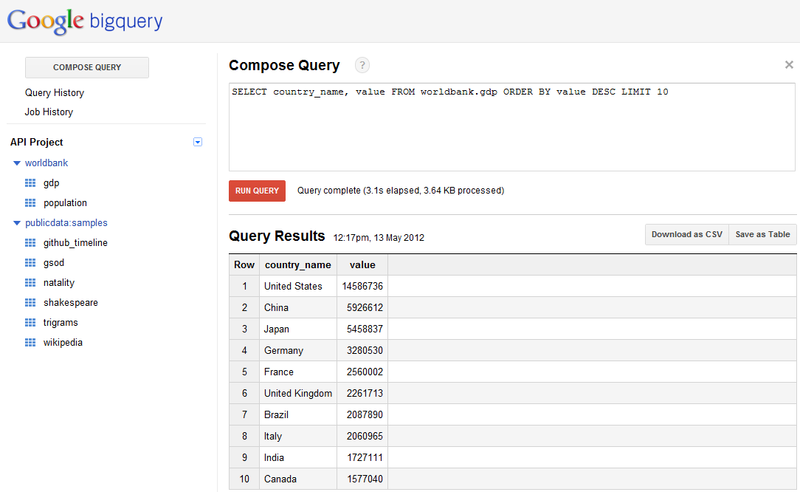 orldbank.gdp ORDER BY value DESC LIMIT 10"
BigQuery browser tool and command line tool could do in most of the cases. but hell, aren’t we even thougher guys – Master of the APIs? 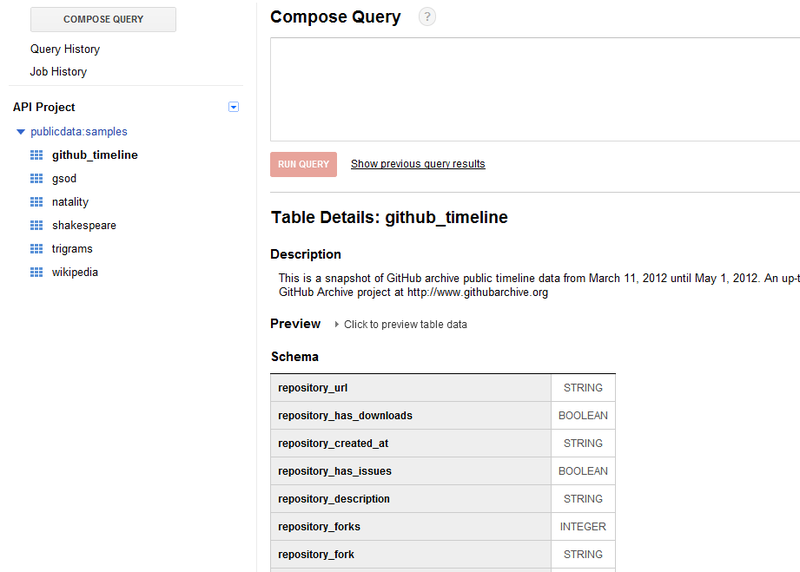 If yes, Google BigQuery can offer APIs and BigQuery client libraries for us, too. These can be in Python, Java, .NET, PHP, Ruby, Objective-C, etc, etc. # Timeout exceeded: keep polling until the job is complete. print ("The credentials have been revoked or expired, please re-run"
storage = Storage('c:\Users\istvan\.bigquery.v2.token') # Choose a file name to store the credentials. # with our good credentials. 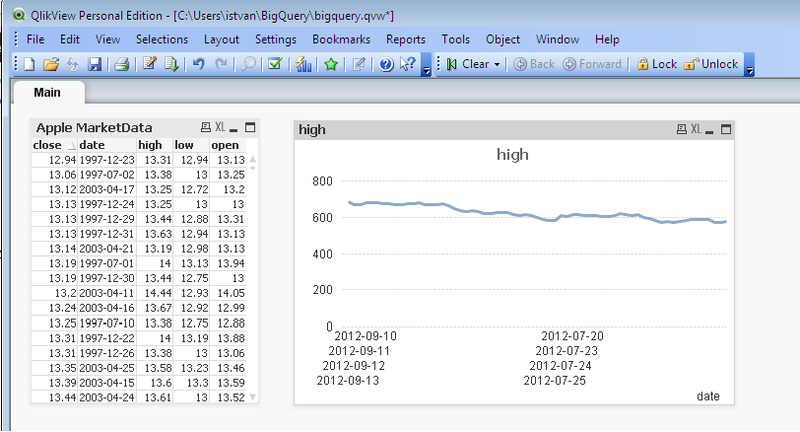 If you want to delve into BigQuery API, here is the link to start.